In the social media era, many new terms have arisen to describe how you – the supplier of services or goods – communicate with your (future) customers. The time has come to examine a few of those terms. As a supplier of a product or a service, you naturally wish to convey your message to consumers. This can either be a simple message (“buy me”), but can also concern the creation of a certain image related to your product or service. And thanks to the Internet and the emergence of social media in particular, you have many tools at your fingertips to convey that message. The technical term used is paid, owned and earned media. The Paid Media are the media that spreads your message for a fee. In other words, here we find the conventional ads via papers, TV, radio, posters, direct mail, paid search on search engines and advertising in retail. Through this channel, you target the general public, in order to attract attention to your brand and draw new customers. 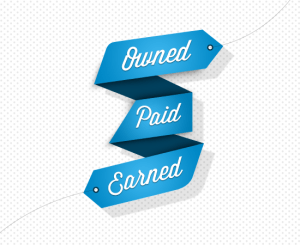 With Owned Media, you control the media yourself and you don’t have to pay for advertising space anymore. Here, you work through your own corporate website, micro sites for special campaigns, a blog on your website, a community that you build around your brand, a fan page on Facebook, etc. This channel allows a more targeted approach of your own customers. The positive message is spread via channels that you yourself control. Finally, we’re going to talk about Earned Media: the publicity that consumers spread and that you ‘deserve’ because you deliver a good product or service – or because you came up with a brilliant marketing campaign. Word of mouth, comments on Facebook or Twitter (via @mentions or @replies), Vine, blogs, forums and sites on which products and services are discussed all fall under this category. With these earned media, die-hard fans get the messages across on their own. When somebody who is not ‘connected’ to your company mentions you on Twitter, Facebook or any other social media channel, you are reaping the benefits of earned media. By now, most companies have adapted their strategy to those three channels and work with an advertising management agency to develop their campaigns and ads (paid media), a web agency to design and implement online content and develop a Facebook campaign (owned media) and a social media expert to communicate with consumers, respond to their comments, etc. via social media (earned media). The lines that separate the three channels are, however, fading. Tasks shift from one media manager to another with increasing frequency. Because one of these pillars can create the Facebook page, but who has to reply to the posted comments? The PR agency or the social media manager? This media convergence in turn creates new trends. In the earlier marketing and advertising landscape, the agency was the source of inspiration; it had to provide the creative element and it dictated the entire course. Now though, it seems that owned media are starting to set the tone: listen in with owned media, perform experiments with it and then pass on those results to paid media. Here are a few numbers in conclusion, to better illustrate the importance of earned media. A recent study by Econsultancy and Adobe revealed that 84% of the respondents said that the trend toward earned media via social media marketing was of medium to high importance for their company and 90% believed that this would be the case by the year 2015. According to a study by Technorati, 55% of 150 major brands had already set a defined media target.